We are now home and have had a little time to sort through and categorize some of the many images we got during our recent trip. 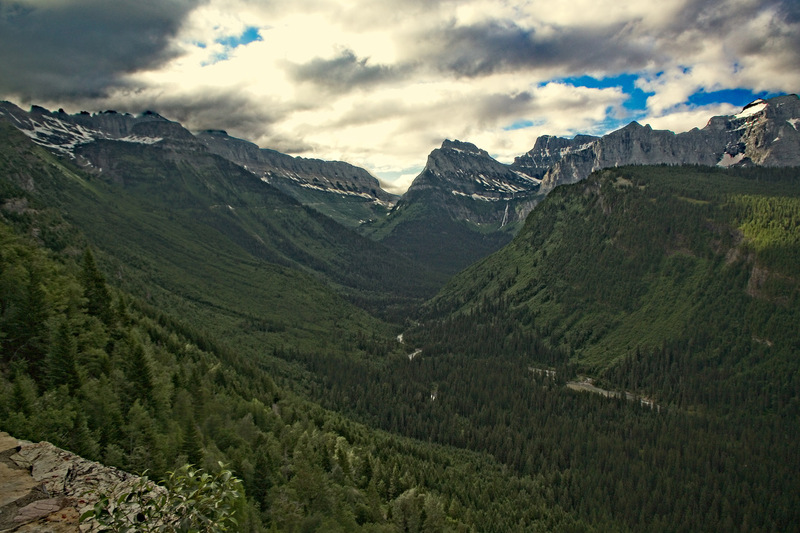 Below are several from Glacier National Park. We had hoped to be able to include all our images in this posting. That is not going to work as there are just too many. Hopefully I can keep track of what I have posted and when I get the job completed we will try to post any new ones. 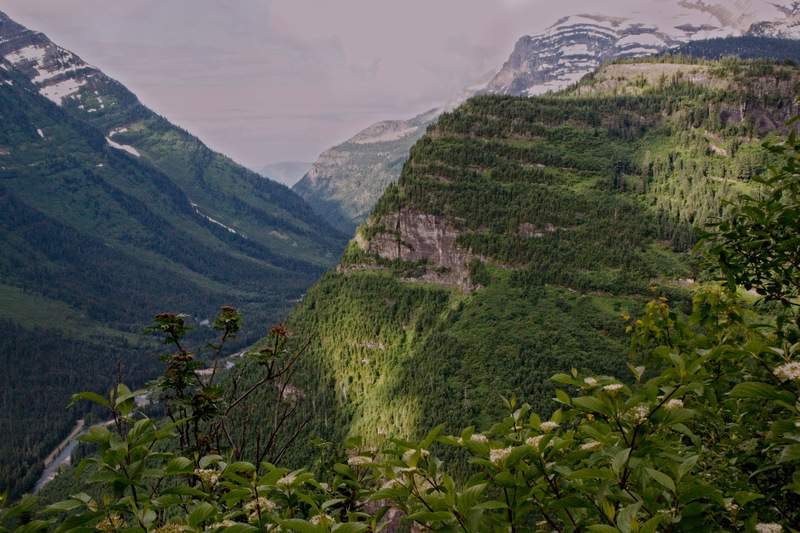 Glacier is an unbelievably photogenic park, a new view around every curve in the “Going to the Sun” road! After three attempts to be there when the “Going to the Sun” road was open we finally succeeded! 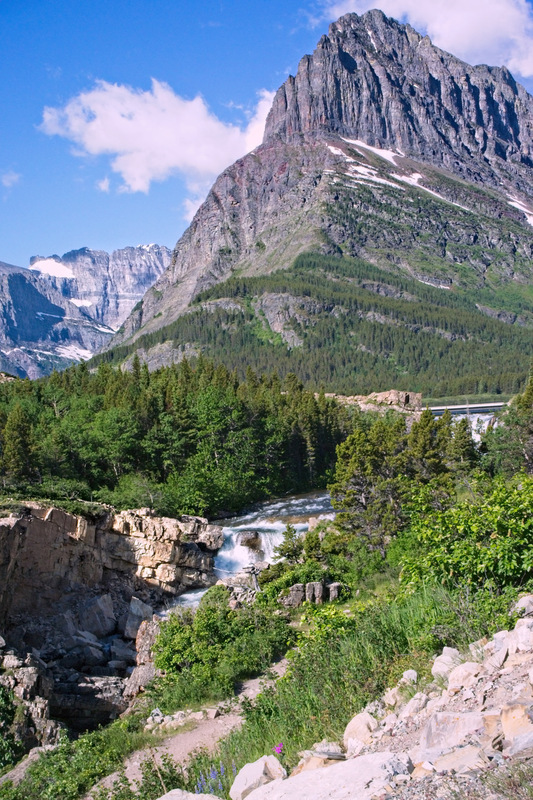 Glacier has to be one of the most scenic of all the National Parks in the lower 48 states. Around every curve you are greeted with another absolutely stunning vista. As our Roadtrek was just a bit longer than allowed we joined with Laura Robinson in getting a rental car for the trip and left early in the morning. Both were wise decisions. On our way up to the “Going to the Sun” road the pull outs were not busy and we could take our time in enjoying the views and taking photos. On our way back later in the day parking spaces were impossible to find. Our trip was on the second day the road had opened and the park was packed. 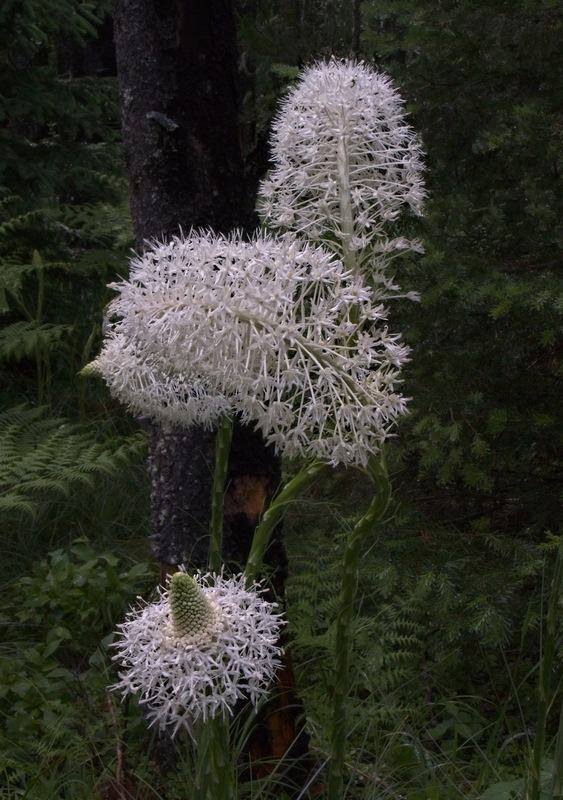 The first image is of bear grass. There was a bumper crop of this unusual flower at Glacier this year. Below is the entry to the Lodge on McDonald Lake. 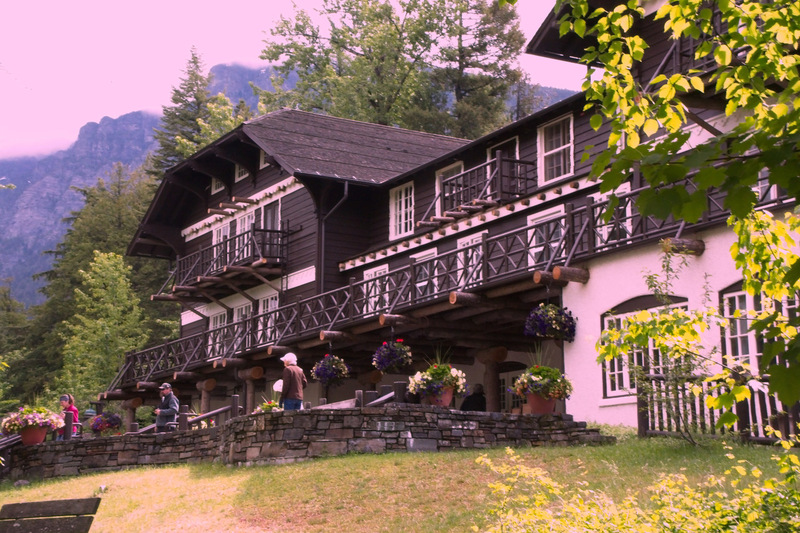 Originally built in the early 1900’s it was only accessible by boat so the front of the Lodge faces the lake. 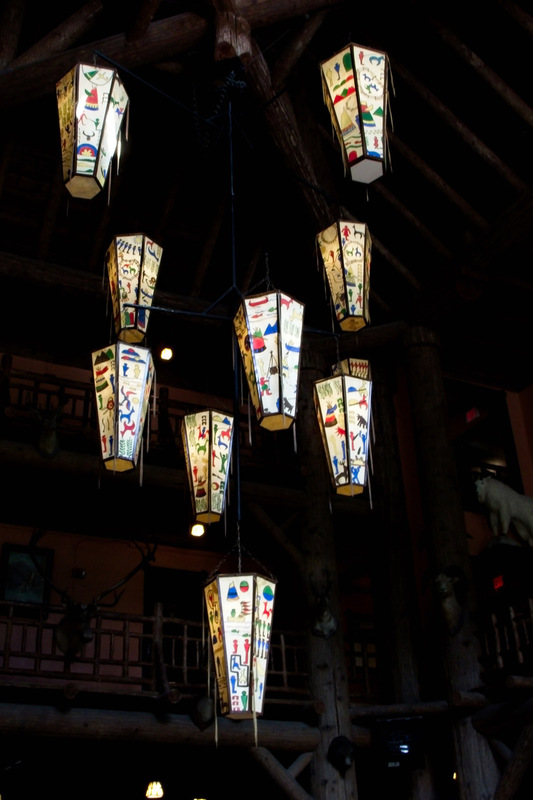 Below is the chandelier in the lobby of the Lodge on Lake McDonald. 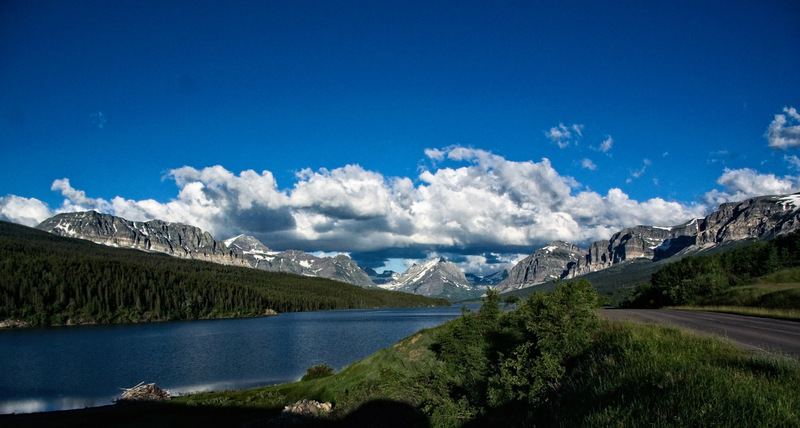 The image below is of Lake Sherburne and some of the mountains surrounding it. This was taken from the Many Glaciers road. 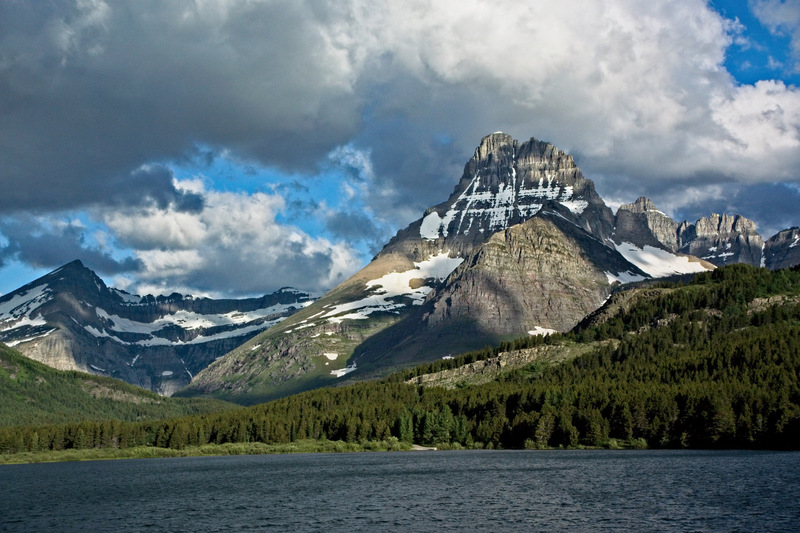 There are many impressive mountains in Glacier National Park. And several lakes. 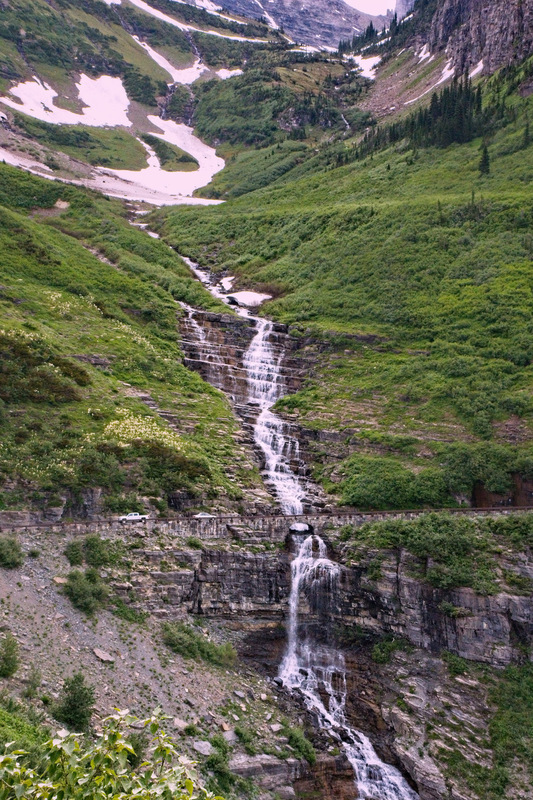 Mountains and waterfalls are primary features of Glacier. 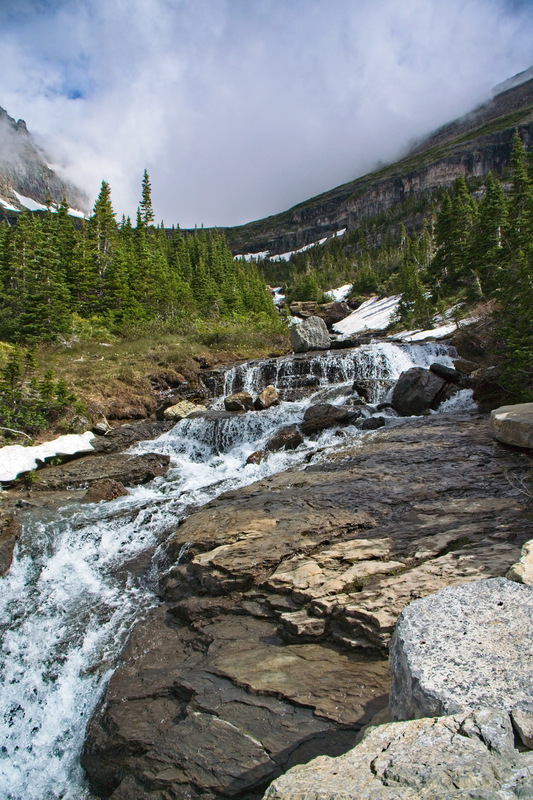 With the record snowfall last winter the snowmelt had all the waterfalls flowing nicely. We truly enjoy traveling in our Roadtrek. We now have over 25,000 miles on our new one after putting about 135,000 miles on Geraldine II. As we proceeded up the “Going to the Sun” road for our first time to be able to ascent all the way to the top we stopped many times to enjoy the wonderful vistas we encountered around every curve, and there a lots of curves. This image may give you some idea of what it is like to drive the “Going to the Sun” road. Waterfalls coming down on the road, steep cliffs on the other side. 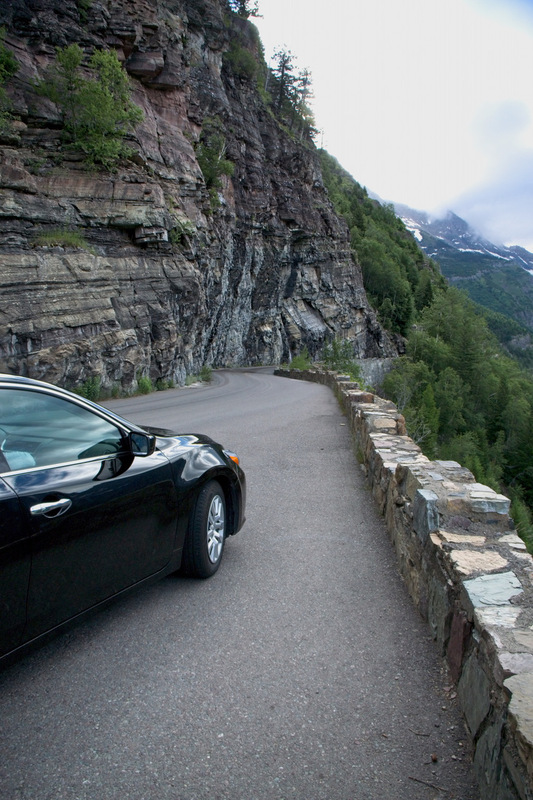 Narrow and very curvy, and a great experience with magnificent vistas around each and every curve. This was taken in one of the many pull outs, most of which are not very large. 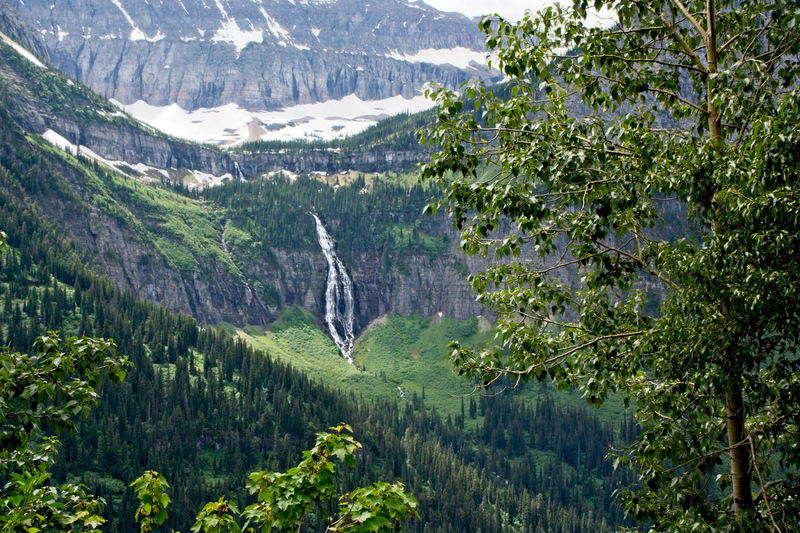 Glacier National Park, mountains, valleys, rivers, waterfalls, beautiful! This is just one of the several waterfalls. Another magnificent vista from the “Going to the Sun” road. With the snowmelt underway the waterfalls were flowing nicely. 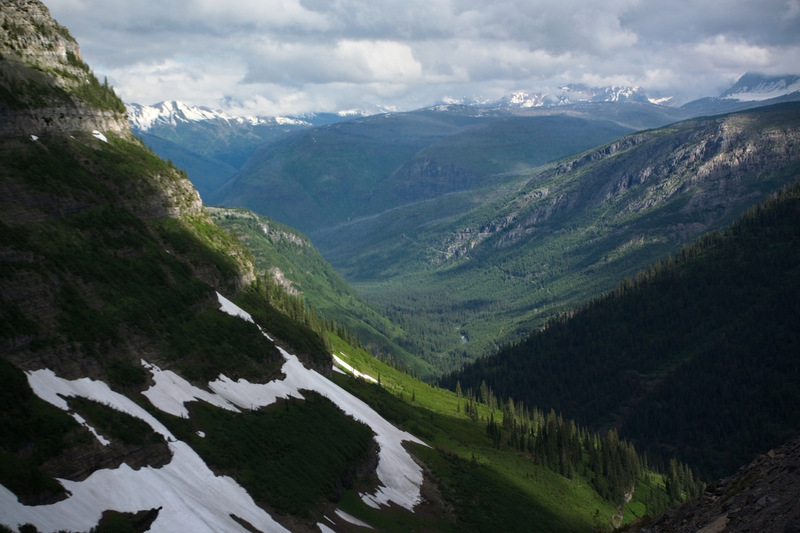 It is impossible for me to describe the beauty of Glacier National Park. Hopefully with these images you will have an idea. 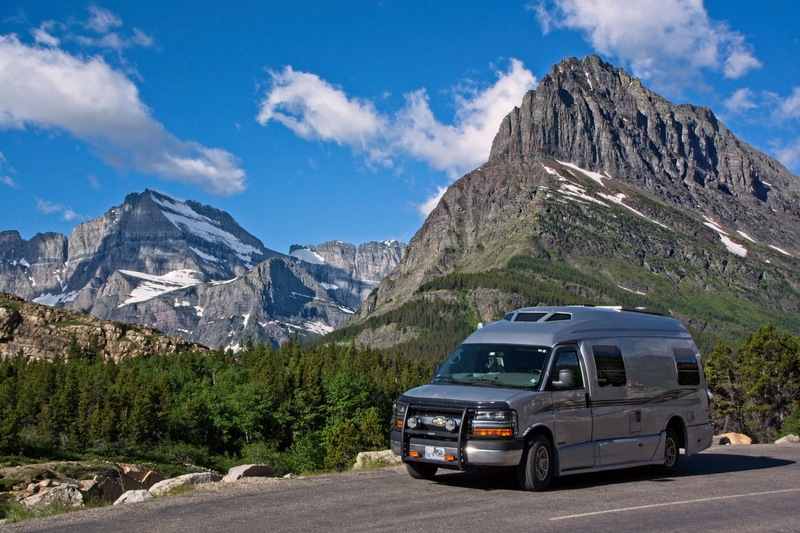 We hope you enjoyed this mini-tour of Glacier National Park and a few of the wonderful vistas from there.